In sports entertainment, Bill Goldberg could be the professional wrestler against whom all others gauge their accomplishments. In just over five years, he became one of the industry's most bankable stars -- and a two-time World Heavyweight champion. However, as he reinvents himself as an actor, Goldberg looks to a former in-ring rival as the blueprint for success. "'The Rock' has definitely set the bar," said Goldberg of fellow World Wrestling Entertainment mega-star-turned-actor Dwayne "The Rock" Johnson. "He's in a class by himself, and he always will be, I believe." Like Johnson, Goldberg exploded onto the wrestling scene in the late 90s. As "The Rock" dominated WWE rings, Goldberg owned rival World Championship Wrestling. Boasting a lengthy undefeated streak, he claimed two United States championships, the company's tag team titles (with the legendary Bret "The Hitman" Hart) and, eventually, the WCW World Heavyweight title. 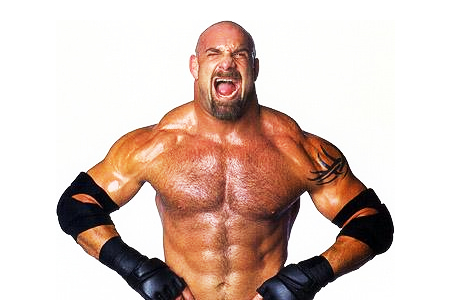 Goldberg was named 1998's "Rookie of the Year" and "Most Inspirational Wrestler" by readers of Pro Wrestling Illustrated. Soon after, while on a brief WCW hiatus, he made his feature film debut in Universal Soldier: The Return opposite action star Jean-Claude Van Damme. When WWE bought WCW in 2003, Goldberg signed a one-year contract with the company. In a pro wrestling dream match, his first target en route to the WWE title was eventual 10-time World Heavyweight champion "The Rock." The organization's top draw at that time, Johnson was also fresh from playing the title role in big screen smash The Scorpion King. "He's an 'entertainer,' and always has been -- in the ring and out," said Goldberg of "The Rock" during a recent telephone interview. "I'm more of a 'competitor;' I like to go in the ring and let people judge the competition." While "The Brahma Bull" lost their WWE confrontation, he is now "laying the smack down" on Hollywood's A-List -- and, obviously, Goldberg is taking note. While "learning to grasp the 'entertainer' role a little better," the Oklahoma-born performer's identified other areas where Johnson also leads the pack. Goldberg Takes Down 'The Rock' at the 2003 WWE 'Backlash' Pay-Per-View. Goldberg praised the diversity of his WWE colleague's film roles. From high profile action films like San Andreas and The Fast and the Furious franchise, the most recent installment of which shattered global box office records, to playing gay in Get Shorty, Johnson has done it all. "Certainly through his choice of scripts, he has shown the ability to go from one end of the spectrum to the other and back again," Goldberg says. "I like that ability to show range." Though Goldberg says he's being offered more diverse roles, he admits not yet stepping too far outside the box. "When I get more comfortable at this thing they call 'acting,'" he stated, "I will venture out of my range of comfort too." Goldberg plays it safe in upcoming film Check Point. Directed by Thomas J. Churchill and scheduled for release in 2016, the film also stars William Forsythe (TV's Boardwalk Empire), Kenny Johnson (Bates Motel, Chicago Fire), fellow WCW alum Tyler Mane (X-Men) and Mindy Robinson (King of the Nerds). In it, the grappler portrays a U.S. military veteran recently returned from two tours of Afghanistan. When a terrorist cell is discovered in small town America, he joins "a ragtag group of people brought together with the task of protecting our freedom as we find the insurgents are homegrown." "With my involvement with the military, and always wanting to raise awareness," he shared, "I thought it was a perfect project." In addition to being "surprised" by the plot -- "And it takes a lot to surprise me," he confessed -- Goldberg was attracted to the film's sensitive subject matter. Noting the movie centers around a hot-button topic (national defense), the idea a threat might come from within further amps tension, he says. "Terrorism, as a whole, is -- I don't want to say 'taboo' -- but it is a very emotional subject," acknowledged Goldberg. "For the plot of the movie to be that it is homegrown... The fact that it happens on our own soil and at the hands of our own citizens is touchy." Ironically, Goldberg points out, a scenario similar to the film's premise played out in real life the very day his filming schedule wrapped. On July 16, a gunman opened fire on two Chattanooga, Tenn., military recruiting facilities. Four U.S. Marines were killed; numerous others were injured before local police stopped the assailant. "Not only is it a reminder of the harsh reality that terrorism exists," said Goldberg, pointing to the "shock and awe" following the attacks, "but that it can actually be carried out on somebody that was born in the United States." It is a concept Check Point drives home, he says. "You obviously can't racially profile them at that point; you can't religiously profile," Goldberg asserted, "They're amongst us. They are us. So you can't really differentiate between friends and foes." Now as the film moves toward release, Goldberg sees it as a key component in his continued growth as an actor. While the role is certainly no "departure from the norm of who people see" him as, it was a positive step for his career. "Is it stretching my acting legs?" he asked in conclusion, "No -- and yes. The part is an extension of myself, but any time I'm able to surround myself with experienced actors, I can do nothing but grow."